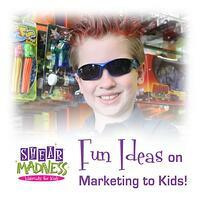 Fun Ideas on Marketing to Kids! Each year, kids are reported to influence around $1 trillion in family spending! And with everything from toys, clothing, jewelry, personal care products (toothpaste, shampoo, cosmetics, etc), to eating establishments, personal care franchises (haircuts, nail salons, and more), it's easy to see why! 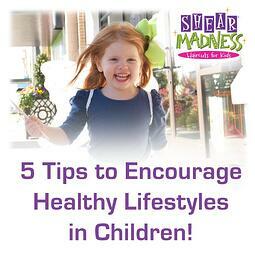 Kids have an interest in what's new, having fun, and looking and feeling great! So if you're looking for a few ideas on marketing to kids and how to let people know about the kinds of products and services your business offers, consider checking out the following cool and creative marketing ideas! School is Cool: Find way to let kids know about your business through running an ad in the school yearbook or newsletter. Sponsor a kids club at school by donating supplies for it, or consider helping out with a school fundraiser. And don't forget the Homeschool market! There are many homeschool conventions where businesses advertise kid friendly products and services. Parades and Town Festivals: There are always lots of kids at parades, town festivals and local fairs! Decorate a cool car and drive it in a parade, or have a booth at a local festival or fair. 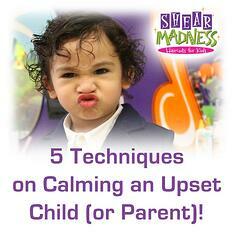 Consider having a game or two that kids can interact with and win free prizes. Whatever you do, be sure to have fun and decorate in such a manner that it catches kids eyes and gets them excited about what you do! Contests: Hosting a contest can be a fun way to draw positive attention to your brand. This could involve something simple like a coloring contest (with a specially designed coloring page for your business) to a contest that encourages kids to be creative in making something fun that features your product. Other ideas could include a model contest where parents take pictures of their kids having fun with your product or service. Prizes could include coupons, certificates, free stuff from your store, appearing on your social media sites, and much more! Free Stuff: Kids love to have fun and get something for free (that their mom and dad won't say "No" to!). These can be inexpensive trinkets like crazy pencil toppers, silly sunglasses, fake mustaches, foam airplanes, trading cards or even helium ballons branded with your product. Sports and More: Kids love sports, outdoor activities and special interest clubs (like lego building clubs and summer reading clubs at the local library). Consider advertising at the local baseball or soccer field, or sponsoring a summer reading program. Possibly look at donating sports related items to a kids team, or outdoor supplies for a scouting organization. Geek Culture: Kids (and their parents) today really enjoy a lot of popular sci-fi shows, graphic novels, comics and board games, collectible card games and video games. Consider hosting an event at a local comic book shop, game store, comic book or sci-fi convention. Encourage those from your business who attend to dress up as fun characters, and offer cool sci-fi related gifts branded with your product. 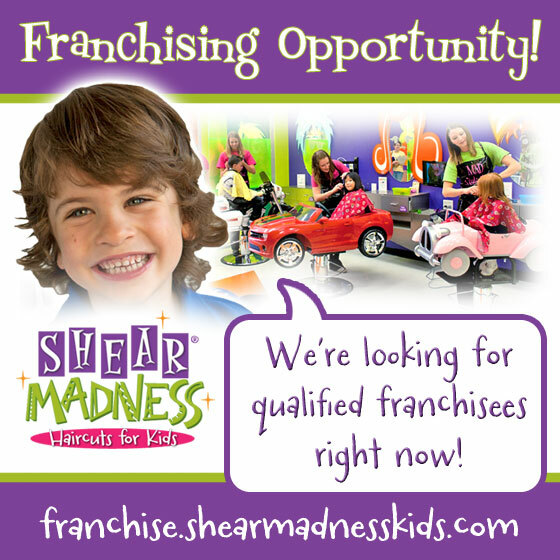 Interested in learning how YOU can join the Shear Madness Haircuts for Kids family and run your own successful small business? We are one of the fastest growing kids hair salon franchise systems in the industry today! If you would like to learn more about small business marketing, great marketing strategies or how to become a successful owner of your own kids hair salon franchise business, please click below or call 1-888-98 GONE MAD! Easter Eggs, FREE Haircuts, DIY Nails & More! March Fun and Special Sales! FREE DIY Nail Stations! If you're looking for a memorable activity to do with your kids, why not come out to your local Shear Madness Haircuts for Kids and check out our DIY Nail Stations set up in celebration of St. Patrick's Day? This awesome event will take place March 16th and 17th (Monday and Tuesday), so be sure to get it on your calendar. It's sure to be a lot of FUN! Easter Eggs and maybe a FREE HAIRCUT! It's hard to imagine with the colder temperatures right now, but Easter will be here April 5th! Starting in March, and running until Easter Sunday, each child can "hunt" for a MadTastic Easter egg in our store! Each will contain a fantastic coupon for discounts or a Free Haircut or candy - its a surprise! Come and Hunt for yours now! March Specials! Maybe it's the longer days, or the feeling that winter is almost over. Either way, here at Shear Madness Haircuts for Kids we're warming things up with awesome specials on manicures, pedicures and more! You'll definately want to check in with your local store to see what's going on. And don't forget our always exciting selection of toys, jewelry, bows, hair care products and more! Girl Scouts: Did you know that the 2nd week of March is National Girl Scout Week? According to the Girl Scouts website, "In Girl Scouts, girls discover the fun, friendship, and power of girls together. Through a myriad of enriching experiences, such as extraordinary field trips, sports skill-building clinics, community service projects, cultural exchanges, and environmental stewardships, girls grow courageous and strong." 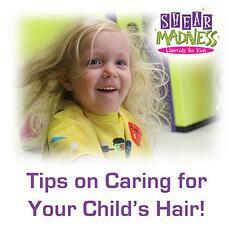 Shear Madness Haircuts for Kids recognizes the valuable contributions of the Girl Scouts! 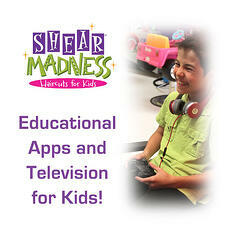 March Shear Madness Fun all month long! You just might feel a little lucky when you discover our free Haircut Fridays, funny jokes, awesome customer feedback and more - and it's all happening right now at our rockin' Facebook page! And if you want more Shear Madness, why not check out our constantly updated Franchise Blog, Instagram, Google+ and Twitter? And of course, don't miss out on some of our favorite Shear Madness pins this month on Pinterest! Great Coupons! Are you looking for that pot of gold at the end of the rainbow? If so, then you're sure to appreciate some of the "golden" offers available on our coupon page! Whether it's shopping for a St. Patrick's Day celebration, an upcoming birthday, or other special occasion - you're sure to find that Madtastic deal you’ve been waiting for at Shear Madness Haircuts for Kids! St. Patty's Day Crafts for Kids: Put a little luck o' the Irish in your March by celebrating St. Patrick's Day with some fun crafts! Check out our cool Crafts for Kids section on Pinterest, and learn how to make Shamrock hats out of paper plates, cute paper shamrock ornaments, a pot of gold at the end of the rainbow party favor - and much more! Have fun, and have a great March! February Newsletter: Valentines Day Specials and more! Coupons and February Special Sales! Valentine's Day Specials! If you're looking for a unique way to show your love this Valentine's Day, a Daddy Daughter Makeover or Mother Son Fun Valentine's Package might be just the gift! This special package is only $29.95! This includes one Diva Day, a 4x6 photo, a sweetheart ring and a membership to the Diva Club! There's also an option of adding a haircut for Dad for a total of $39.95. But hurry - this offer ends February 28th (specials may vary by store)! Diva Day & Mad Manes Gift Certificates! A great Valentines gift idea, our Diva Day and Mad Manes (for the boys) gift certificates are a perfect surprise for this special holiday! These certificates include $10 of purchases from our Toy & Bow Boutique, as well as a mini makeover (or haircut & colored stripes for the boys). So if you'd like to treat your kids to an experience they will long remember, click on Diva Day Gift Certificates! Having Lice isn't Nice! Tabby Bibbs, manager at the Lee's Summit Shear Madness Haircuts for Kids notes that, "Head lice can happen to anyone at anytime, no matter the socioeconomic status." So if you'd like a little extra insurance in keeping the creepy-crawlies away, be sure to pick up either Circle of Friends Lice Defense products or our Organic Original Sprout products at our stores. Bibbs says that, "The Miracle Detangler and Leave in Conditioner from Original Sprout helps to repel and prevent head lice - and they smell absolutely wonderful!" 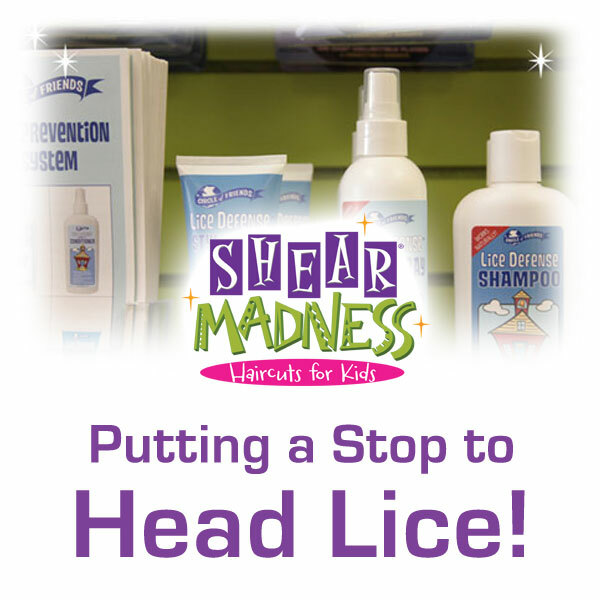 Read our blog post about putting a stop to head lice! 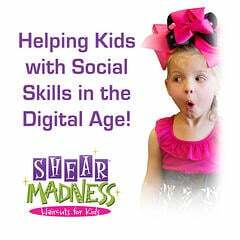 Shear Madness Fun all month long! We've got free Haircut Fridays, funny jokes, awesome customer feedback and more - and it's all happening right now at our rockin' Facebook page! And if you want more Shear Madness, why not check out our constantly updated Franchise Blog, Instagram, Google+ and Twitter? And of course, don't miss out on some of our favorite Shear Madness pins this month on Pinterest! Great Coupons! Do you love saving money? If so, then you're sure to appreciate some of the great offers available on our coupon page! Whether it's shopping for your Valentine, an upcoming birthday, or other special occasion - you're sure to find that Madtastic deal you’ve been waiting for at Shear Madness Haircuts for Kids! Valentine's Day Crafts for Kids: Celebrate Valentine's Day with those you love by making some Valentine-themed crafts! 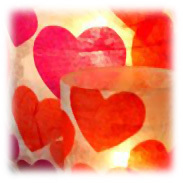 Check out our cool Crafts for Kids section on Pinterest, and learn how to make Valentine candle holders, heart-shaped animal Valentines, paper heart garland and more! 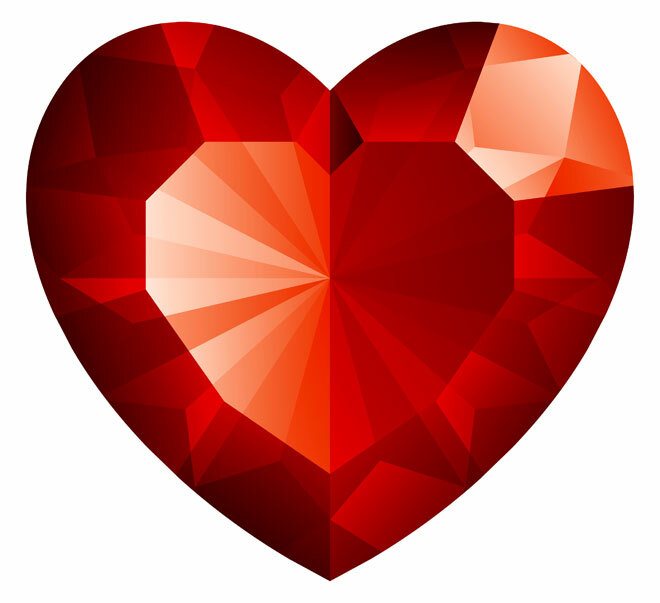 Have fun, and have a great Valentine's Day! Lice Prevention: Putting a Stop to Head Lice! Yikes! Just hearing the word lice can make your skin crawl. According to the Center for Disease Control (CDC), around 6-12 million people are treated for head lice in the United States each year! Why are so many families having to RID themselves of those tiny insects? The answer is all around us: gymnastics mats, football helmets, the cute scarf you tried on at the store, and maybe even those headphones you shared on the airplane. But perhaps the most common transmission of these bugs is through head-to-head touching, which is why it is no surprise that most cases are in children between the ages of 4 and 14 (as children enjoy being in close proximity with one another). Luckily, because our salons have a lot of experience working with children and hair, we have a pretty good idea of how lice can be prevented from entering your home. Tabby Bibbs, manager at the Lee's Summit Shear Madness Haircuts for Kids notes that, "Head lice can happen to anyone at anytime, no matter the socioeconomic status. It is more prevalent 3 times a year - the beginning of the school year, winter coat time, and when pools open for the season. It's a never ending cycle." Head lice are small - about the size of a sesame seed. They are wingless, and as such can't fly or even hop. But with feet that are especially designed for hanging onto hair follicles, these annoying little parasites can live up to a month on the head. However, they will die within 2 days of falling off - which is why sealing infested items in plastic containers or bags for around 2 weeks will make sure there are no surviving lice. Lice will also lay tear-drop shaped eggs (nits) that are attached to hair follicles near the scalp. So what should you do if you find lice in your home? The first and most important thing is not to panic! As stated by the CDC, "head lice can be a nuisance but they have not been shown to spread disease. 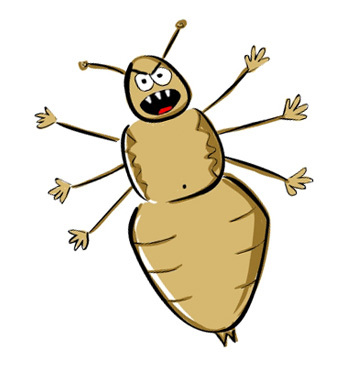 Personal hygiene or cleanliness in the home or school has nothing to do with getting head lice." As for treatment, it's totally up to the parents. We suggest getting it professionally done, because you have follow up visits. And as always, remember not to share hairbrushes, caps, beanies or any other head covering with others. If your child is in school or daycare put their coat, hat and gloves in their book bag. Also, be sure to ask their teacher if there have been any cases of lice every few weeks. Keep boys hair cut shorter, and girls hair in a high ponytail or braid.